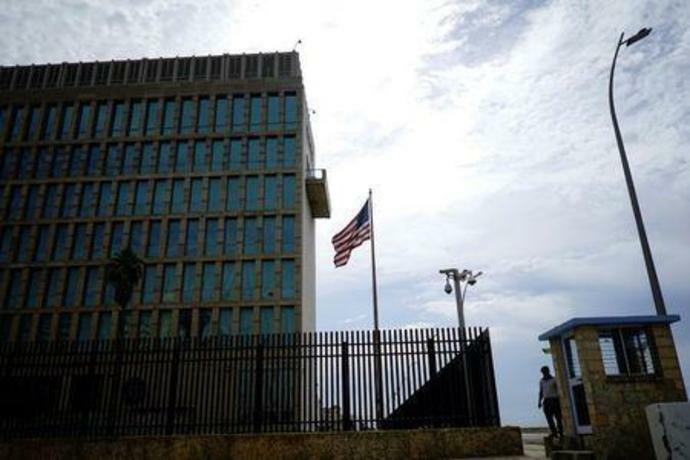 A security officer stands next to the U.
WASHINGTON (Reuters) - U.S. officials are still investigating health problems at the U.S. embassy in Cuba, and do not know who or what was behind the mysterious illnesses, which began in 2016 and have affected 26 Americans. "We don't know who is responsible and we don't know what is responsible for this," Kenneth Merten, Acting Principal Deputy Assistant Secretary for Western Hemisphere Affairs, told a House of Representatives Foreign Affairs Committee hearing. The administration of President Donald Trump, which has partly rolled back a detente with Cuba, responded to the health problems by sharply reducing staff in Havana and in October expelled 15 Cuban diplomats. In April, Canada said it would remove families of diplomats posted at its embassy in Cuba as information from medical specialists raised concerns about a new type of brain injury. The State Department said last month it brought a group of diplomats home from Guangzhou, China, over concern they were suffering from a mysterious malady resembling brain injury. Merten said he was not aware of any other embassies having been affected. "We have taken this ... very seriously, both in the Cuba context and the China context which is, frankly, still very much evolving," he said.